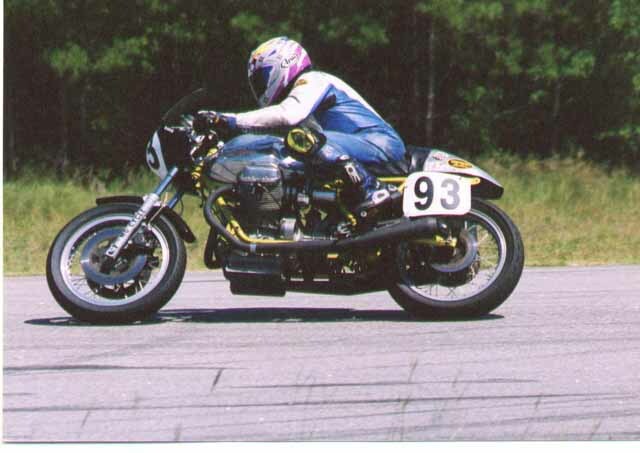 Another Moto Guzzi made the record books this year when David Fulkerson, riding the MG CYCLE Moto Guzzi race bike, won two National Championships in the American Historic Racing Motorcycle Association (AHRMA) Historic Cup Roadrace Series. Along the way to the National Championships, the MG CYCLE team also earned four regional championship titles. National titles now held by Dave and the MG CYCLE Moto Guzzi are the AHRMA Progressive Suspension Historic Cup Roadrace Series 2002 National Champions - Formula 750 class, and 2002 National Champions - Formula Vintage class. In addition, on the regional level we took both AHRMA Masters of the Midwest and AHRMA Heroes of the Heartland Series 2002 Regional Champions in both Formula 750 class and Formula Vintage classes. We are quite pleased with this, especially considering it was our first season on an undeveloped motorcycle. We were lucky to have a local rider as talented and determined as David Fulkerson. In addition to his riding skills, Dave's experience enabled us to begin sorting out the bike early in the season while we still had time to chase the points needed for a championship. This advantage, combined with the competency and durability of our Moto Guzzi, were the keys to our successful season. Preparations for the 2002 racing season began at the MG CYCLE Holiday Party in December, 2000. During a late night of partying we began tearing apart the donor LeMans 850 that would become the race bike. It didn't take long to reduce it to a pile of parts, but it would take more than a year to put it all back together again as a competitive and AHRMA legal machine. Major contributors to the project were Ace Malott, Art Daley, Dave Fulkerson, and myself. We finished it in mid February, just in time to pre-register for the first race of the 2002 season. I'll try to condense the technical details to give you an idea of what we did. Custom made performance parts do not fit our budget, so we needed to design the motor around common and ordinary off the shelf parts that we normally stock in our inventory. The first task was to reduce the capacity of the engine from 850cc to 750cc. The key to this was to use a short stroke (70mm vs 78mm) crankshaft as used in V7 Sport or Ambassador. To take advantage of the LeMans 850 cylinder heads that we had, we used Gilardoni LeMans 850 replacement piston and cylinder sets, with the cylinders shortened by 4mm to match the short stroke crank. To help our valve train withstand constant high rpms, we used special hollow tappets and short push rods, again shortened by an additional 4mm to account for the now shortened cylinders. We used roller tip rocker arms (generously loaned to us by Charlie Lunde). Ace reduced friction even more by installing roller bearings along the rocker spindle, and between the rocker and the carrier. We used a Megacycle camshaft, a total loss electrical system, aluminum timing gears, a Dyna electronic ignition and Dyna coils with one spark plug per cylinder. We also used 40mm Dellorto carburetors opened by a Tomaselli Daytona 2C throttle, Tomaselli clip-ons that proved themselves by surviving crashes with zero damage, all Brembo brake components - rotors, calipers, master cylinders, and pads. In addition we used Borrani and DID wheels, until the wide rear DID wheel was destroyed, then we used all Borrani rims, and the skinny little Borrani rim seemed to make the bike handle better. We used Dunlop racing tires from Bob Barker Engineering, Tarozzi rear set foot pegs and controls, a homemade shift linkage to produce a GP shift pattern - it took months to perfect it, three quarts of oil with a sump spacer and a homemade crank scraper/windage tray to control crankcase oil issues and ventilation and never lost an ounce of oil all year. We also used a remote starter on a home-made cartmade fro	m a TidyCat cat litter pail - we called the contraption the TidyCat and thanks to Art Daley it was the nicest starter cart that I saw all year. We used an old Moto Guzzi factory race kit exhaust (again generously loaned to us by Charlie Lunde) for most of the season, but when noise requirements had us changing it out for a Lafranconi Competizione exhaust system we actually made more horsepower at all rpms. The Lafranconi system also eliminated a midrange dip in the power curve. We used the original Moto Guzzi connecting rods and never doubted that they would hold it together. We were proud of the pump gas that we used for most of the season, until Bill Wisenant at Motorcycle Performance in Madison Wisconsin showed me on the dyno that you can literally pour more horsepower into your engine in the form of legal race fuel. We used a lightweight single plate clutch assembly with an aluminum flywheel that spins up fast and hooks up really well, all with a light lever pull. To continue, we used my private stash Marzocchi Strada 38mm forks, and later in the season we used RaceTech cartridge emulators inside them. We used shock absorbers from Koni, WORKS Performance, and Ohlins. Despite all the time and money we put into the suspension we still never got it right and it chatters like a red squirrel. We used the stronger swingarm from a LeMans 1000 and wished it were shorter. We were lucky enough to have rear drive set ups in every ratio that Moto Guzzi used on production bikes and nearly used them all. We were extremely lucky to have stumbled onto an old close ratio 5 speed gearbox and almost destroyed it before removing half the engagement dogs. We used a lightweight aluminum fuel tank and tail section, with a homemade leather covered seat (again thanks to Art Daley). The aluminum bodywork turned out to be more crashworthy than I thought it would be. We used a repro LeMans 850 fairing. Within hours of final assembly we had the bike on the dyno at Suter's Speed Shop in Madison, Wisconsin. The bike produced just under 7	0 horsepower at the rear wheel and suffered serious valve float at 8000 rpm. We shimmed the springs to near coil bind prior to the first event and picked up a few rpm, then later switched to better springs and now can easily run 8000 rpm with no problem. The racing season started with a practice day in late February at an airport racetrack in Deland, Florida, just a few days before the big race at Daytona International Speedway, during Bike Week 2002. It was the first time the bike had been run on the track, first time Dave ever rode it, and after a few laps we knew we were in trouble. It shifted like an old truck, the suspension was not even close, and we had a bunch of other teething problems. Regardless, we were there, we did what we could to make it better, and we took a 5th in F750 and a 2nd in FVint. We were glad to finish the race at Daytona a couple days later, where we took a 12th in F750 and a 7th in FVint. We went home glad to have survived and with a long list of improvements that needed to be done to the bike. 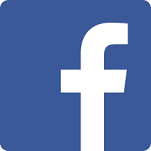 The next event was a double header in early April at Hallet Motor Racing Circuit in Hallet, Oklahoma. We thought we had most of our problems ironed out, but quickly discovered otherwise. The transmission still shifted poorly, and we were just beginning to realize it was caused by a combination of our home-made shift linkage and the six dog transmission gears. We had been using smaller, lighter weight tires, but we discovered here that the small tires weren't up to the task. So, Dave missed shifts, our suspension wasn't doing it, and we took a 3rd and a 2nd in F750 and two 3rds in FVint. Charley Cole on his Guzzi beat us in every race. Charley is a great guy and formidable competition. It was really a special treat to watch and listen to two Moto Guzzi big twins running against each other on the race track. I wonder how many people have had the chance to hear it. Surely it's not a common occurrence. Back to the shop to straighten out some more of these problems. We didn't race in May because we couldn't afford the time and expense of driving the dog and pony show all the way to California. AHRMA recognizes that people can't always do that, so they set up the points system to where only the top 75 percent of your finishes count toward your final points. That means you can skip a couple races and still have a shot at the championship if you do well at the events that you compete in. Since our season was looking so-so, we decided we'd skip the California events and concentrate on getting ready for South Carolina. Carolina Motorsports Park in Kershaw, South Carolina, early June. This was another double header (two races Saturday, two races Sunday - most AHRMA events are this way). We had a bittersweet weekend. We pitted with Charley Cole who turned out to be such a swell guy I almost hated to be competing against him. But, we had some of our problems sorted out this time. We had larger tires more suited to the task at hand, and we thought we had our suspension dialed in a little better. We made a new shift linkage with bearings rather than bushings. Charley was having electrical troubles. In the F750 class on Saturday we took our first win of the season. We followed it with a 2nd in FVint, losing to a fast Harley, which was disappointing. Then on Sunday, in F750, we had our first and only mechanical failure of the season, an exhaust valve did a tulip imitation, eventually pushing a rocker arm through the valve cover, causing a DNF (Did Not Finish), and worse yet a DNS (Did Not Start) in FVint. Meanwhile, Charley Cole overcame his electrical problem and won both events on Sunday. We went home with a broken motor and another list of things to do. It looked like the season had promise, but we needed points badly if we were to have a chance at any championships. The next race was closer to home in Grattan, Michigan, only two weeks away. Grattan Raceway Park in Grattan, Michigan is a familiar place to me, so I felt a bit more at home. So did Dave. Grattan is considered a technical track, and as is typical, the advantage goes to those that know it well. In the past two weeks we had sorted out the bike a bit more. Most importantly we had new valves. We also had new WORKS Performance shock absorbers on the back, and I disassembled the transmission and had the local machinist take off every other engagement dog on the transmission gears. What a difference it made. The transmission now shifts gears extremely well - finally that was fixed. For the first time, Dave never missed a shift all weekend. And as a reward for our work, we won every event we entered that weekend - four wins in four races. Quite a few people noticed how fast Dave was on the Guzzi. During one race, Dave had a big lead when he came onto the front straight and appeared to be casually motoring along, looking backwards trying to see who was in second place. The announcer said over the loudspeakers something to the effect that Fulkerson is looking back wondering where is the competition. We totally dominated these four events. We even started hearing rumors. One guy from California asked me if what he heard was true - we had a factory built road race motor in our bike. Even if there was such a thing, we couldn't afford it! One guy said he heard this was the fast Guzzi that was responsible for Guzzi 750s being banned from racing in some class in some other organization. Ha! It's nice to get some unexpected entertainment value. The next event was in four weeks. If we did good at the next event we would be in the running for the championship. If not, we'd be out of the running and would have to make a call on whether to continue the season. Mid Ohio is a big event. It's mid-July and AMA Vintage Days is going on. Tons of people, big party. People getting their schmooze on. Celebrities. We were lucky enough to be able to share prime garage space with Will Harding and his Indian team mates Jim and Mike Meyers. It only cost me a T-shirt, but Dave had to cook dinner. It was more than worth it, we felt like VIPs occupying that prime real estate. The bike was still getting better, we had our system down better, everything was coming together, the event was grand, everyone was there. Now that our transmission problems were sorted out, our suspension problems became more prominent and surfaced as limiting factor number one. Saturday's racing was bittersweet. We won both events, taking 1st in F750 and 1st in FVint, but during the FVint race we were involved in a controversial incident that resulted in fellow Guzzi competitor Charley Cole crashing out, breaking his collar bone. The incident really took a lot of the fun out of the weekend, even though Sunday, Dave again took 1st in FVint and took 2nd in F750 to one of those fast Harleys. Worse than the circumstances surrounding the incident, Charley would be out for the next race and would no longer be in the points race for the national championships. Sunday's win in Formula Vintage almost didn't happen as a footpeg/shift lever retaining bolt broke on the back half of the last lap - luckily Dave had enough lead to cruise in for the win without a shift lever or a left foot peg. He was able to shift into high gear by kicking at the remaining linkage. But with the three 1st and one 2nd place finish, we were definitely in the national championship points race for both classes. It was great having so many Guzzi fans at this event. Putnam Park Raceway, Cloverdale, Indiana, middle of August, weekend after the Wisconsin Guzzi Rally. Several Indiana Guzzi fans were in attendance. Saturday started out good with Dave taking a 1st in F750 and a 2nd in Formula Vintage behind a very fast Yamaha 750. Sunday was even better as we took 1st place in both classes. With Sunday's Formula Vintage 1st place finish we actually clinched the Formula Vintage National Championship mathematically, with three double header race weekends left in the season. Even if someone else won the next three rounds, no one could possibly score enough points to beat us, so we had Formula Vintage wrapped up. We didn't realize it at the track, so no celebration. Talladega Gran Prix Raceway, Alabama, end of September. We considered this to be our chance to wrap up the season and cinch the F750 Championship. If we could win both Saturday and Sunday's races, and if the main competition (nice guy and also a formidable competitor Ivan Messina on a BMW) didn't do so well, we could potentially have the title wrapped up, and not have to drive all the way to Florida for the final event of the year. We were so into this idea that we decided ahead of time to skip the FVint races which we had wrapped up anyway, and instead we'd save the wear and tear on the bike, preserve our health, and save some money. So we registered only for the F750 races. The Ohlins guys paid us a lot of attention over the weekend, which was nice. They let us use a set of Ohlins shock absorbers and with their fully equipped truck/workshop, made numerous changes to dial them in as best they could. This gave us a lot of confidence going into Saturday's race, knowing that we had the rear suspension as good as it could be. Unfortunately, all hopes of pulling off our plan were dashed when Dave crashed out of the race before the half way point. It was our first crash all season. Dave got a little beat up, and though the bike looked worse than it was, it was nonetheless battered. Our only wide rear wheel, the DID, turned to a potato chip with eight spokes broken out of it. Luckily, Dave wasn't hurt bad, and we actually brought along a spare rear wheel. In fact, we had all the spares we needed to have it race ready for Sunday morning. Sunday morning came, we did practice to sort out the damage and feel out his injuries, and later in the day Dave took a 2nd place finish to a fast Triumph. Our points lead shrunk to about half of what it was before the weekend, the competition was catching up, and we didn't have a choice - we had to go to Florida in a few weeks for the last race of the season. North Florida Motorsports Park, Jennings, Florida, mid October, the last race of the season. New track, we heard it was a tight track and we'd been wanting to try a shorter swingarm all season, so we decided to make the change (foolishly in retrospect) before the final event of the year. Knowing it's risky to make changes so close to the end, we brought along everything needed to put the bigger swingarm back on. Sure enough, it was back on before the end of practice on Friday. We were relieved to be back the way it was, but the Ohlins guys didn't show up, so we were back to our old shocks. We had to buy another new tire at the track, and were happy to see the track provided a tire machine for our use. Everyone was particularly friendly this weekend, it's the last event of the year, lots of thanks and good byes, beers, and Barbecues. Our points lead was only about 500 points, there was no room for errors of any kind, we had to do well. Saturday's race came up, and to our horror, Dave crashed hard about half way through the race. He was hurt, his collar bone was broken, the bike was all bent up and broken, but again, we had the spares to put it back together for Sunday. We borrowed a straight front wheel from Stan Friduss and put our brake rotors, spacers, and new tire on. Dave headed off to a hotel for some much needed rest and recovery with his girlfriend. John Boettcher rode down for this event and I was really glad he did because he took the time to help me get the bike race ready before leaving for the day. John's a strong guy, straightened that frame out with one pull, whereas I was about to black out from pulling so hard. That night, I kicked back to shed the stress. I sat with Stan Friduss watching and listening to Will Harding and his vintage country (and western) band do country hits from the 50's and 60's, drank some beers, and ate another fantastic southern hospitality dinner prepared by the crew from Moonlite Cycles from Spartanburg, South Carolina. I brought several varieties of cheese from Wisco	nsin and most of it was consumed in short order. The barbecue was great. The Moonlite Cycles people are the friendliest bunch of Harley riders I've ever had the pleasure of knowing, truly gentlemen and first class people. Sunday morning was coming down. Dave showed up bright and early, ready to race. His shoulder was so sore he almost dumped it in the pits during practice, so we backed off the steering damper so it wasn't so hard to turn the handlebars. Dave had a plan to relax and let Ivan set the pace until the last lap and then pass him for the win. We knew our Guzzi had more power than his BMW, and we were depending on it. It was the most stressful day of the season. The championship had come down to this one last race. If we won it, we would win the championship. If Ivan won it, Ivan would win the championship. The tension swelled throughout the day, but we managed to stay fairly relaxed. I tried to triple check everything on the bike, good battery voltage, tire pressure, enough fuel, bolts tight, carbs synched, safety wire in place, trying to nip any problem in the bud. Dave was nervous but managed to relax. The race started and I'm sure I was more nervous than Dave was. Dave followed closely behind Ivan for 6 laps. Anyone who was watching knew what was going on. Dave accelerated the Guzzi up to the BMW's rear wheel at the exit of several turns, then let off rather than pass. He was staying with the plan. On lap 6 they were approaching the first lapper when Dave decided to pass and make a run for it rather than risk getting caught up in lapped traffic and losing his chance. It was a good call. The Guzzi passed the BMW on the front straight, right in front of everybody, and Dave poured the coals to it, stretching his lead until the end of the race. It was a done deal, we won, and we were relieved it was over. We were all a little surprised that we pulled it off. The season ended with congratulations, more thanks, more good byes, and a couple more beers. It was a long season, full of high highs and low lows, lots of work, lots of travel, lots of learning, lots of stress, and lots of friendly support without which we couldn't have done it. Thanks to our MG CYCLE customers, without your patronage we never would have had the resources to even consider it. Thanks to all the Guzzi riders that came to watch the races and to those who offered support. Thanks to Red McLaughlin and the Western Pennsylvania Moto Guzzi Riders who helped financially (twice!) with club 50/50 drawings and who, with Tip Paul and crew, threw a great party at Mid Ohio Vintage Days. Thanks to fellow Guzzi racers Charley Cole for his advice and insight, Ken Pitts, Jeff Gundlach, and Tim Gundlach, for their help and camaraderie, and special thanks to Guzzi racer Charley Lunde for his moral support and technical advice and loan of some special parts. Thanks to ex-Guzzi racers Will Harding, Jim Meyers, and Mike Meyers for their generosity, advice and assistance. Thanks to my wife Christine Severin who helped in all manners - besides coming to some of the tracks and helping in the pits and at the shop, and selling MG CYCLE t-shirts at Daytona and Mid Ohio, she made the best sandwiches and packed the cooler so being on the road was more like home. And she didn't complain about all the time I took away to go racing. Thanks to Rick Mahnke for running the shop alone while I was on the road and for not once complaining about those credit card bills. Thanks to John Boettcher (JB Weld) who rode more miles to attend more racing events than any other Guzzi rider, plus took loads of fine photos, helped with crash damage repairs, and provided moral support. Thanks to friends that stopped by and pit crew helpers Art Daley, Kurt Larsen, Mitch Freshour, Andy and Mary Thompson, Chuck Stottelmyer, Troy Peanut Beeler, and various Slimey Cruds. Thanks to Bill Wisenant at Motorcycle Performance in Madison, Wisconsin for his dyno tuning time and expertise and for his machine shop time. Thanks to Steve Suter at Suter's Speed Shop in Madison, Wisconsin for his dyno tuning time and experience. Thanks to Al Ronnerud at Accurate Machine and Tool in Albany, Wisconsin for his timely machine work. Thanks to Mike Rock at Rock Creek Rifled Barrels for his enthusiasm and machine work. Thanks to Lee Potratz for machining the rear drive spacer adapters. Thanks to Greg Voegli and Joey Israel of Ohlins USA for their time, expertise, and the use of their shock absorbers and damping units. Apologies to the others that I'm forgetting - it takes a lot of effort to put a Guzzi on top of the podium! But it was worth it!